Home Book Reviews	Bear Grylls | Ghost Flight, Father’s Day Gift Idea! Bear Grylls | Ghost Flight, Father’s Day Gift Idea! I’m a HUGE Bear Grylls fan. Dave and I went through a serious Man Vs Wild faze and when we actually got to use his scree running technique while completing the Tongariro Crossing (and it worked!) we became fans for life. Ethan loves the Bear Grylls junior novels so I was really looking forward to getting stuck into the first offering in his new adult adventure series. I’m probably not exactly the target demographic but I figure there’s no hard and fast rules when it comes to adventure thrillers! No mucking around, this book is awesome. I believe it’s ‘co-written’ by Damien Lewis, to what extent who knows but the tone and voice is undeniably that of Bear Grylls. This book reads exactly as Grylls talks on tv, adding some authenticity to the fast moving and globe-spanning plot. Our hero and main character is Will Jaeger, who is basically Bear Grylls doing some freelancing under a pseudonym. He’s got some baggage (and a wife and son who’ve been missing for a couple of years!) but he soldiers on and leads an international team deep into the Amazon for a page turning adventure. The premise is a cracker and the twists and turns keep coming until the very last page. The revelation of a covert Nazi enemy is probably the most successful and gripping element in this introduction to Jaeger and his team of soldiers-for-hire. Ghost Flight covers a lot of ground and does seem to skip over a few details fairly quickly but the action is engaging and believable. I found this a surprisingly engrossing read and can’t wait for the second book in the series. 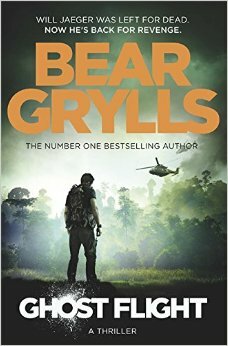 If Dad enjoys Bear Grylls and/or the action adventure genre then this book is an addition to the Father’s Day haul that is sure to please.